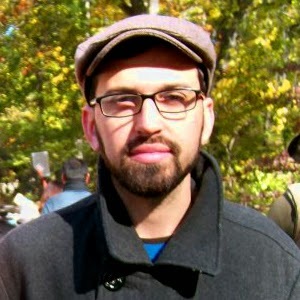 Christopher Bolin lives in St. Joseph, Minnesota, and teaches at the College of St. Benedict / St. John’s University. He has published poems in jubilat, Lana Turner, Post Road, 1913: A Journal of Forms, VOLT, and Cura. He is a recipient of fellowships from the James A. Michener Foundation and the MacDowell Colony, and holds an MFA from the University of Iowa Writers’ Workshop. His first trade poetry collection, Ascension Theory (2013), was published by the University of Iowa Press. The writing of my first book (Ascension Theory) was a series of acts of faith. First, there was faith in the process of writing poems which may or may not belong together: faith enough to avoid pursuing countless series of poems which might have produced poems more quickly, but wouldn't have pushed me into new territory. There was a faith in pursuing each moment of the poems as an "unknowing" participant in the logic, the music, and the terrain of the poem: faith enough to let the poem reveal itself to the imagination. And, ultimately, there was a faith that poems revealed to the imagination--would crystallize so fully that they would offer an experience to their readers. I would say, then, that the first book revealed the mindset I hope will guide other books of poems. My most recent work moves back and forth between a series of poems with a single speaker and 'stand-alone' poems scanning environmental (and spiritual) degradation (as I am unsure there is any separation between the two and all too nervous we will find out). I actually came to writing fiction first, as young person. However, I found it ill-suited for the density of language with which I was working. Of course, at the time, I was also mistaking 'density' for 'intelligence'. Perhaps more accurately, one could say I was mistaking opacity for depth and I was lucky enough to find a few readers who suggested I concentrate on poetry. They might have been (incorrectly) assuming that poetry supports opacity, but the switch seemed to have the opposite effect. I found myself working against the tendency toward opacity. My guess is that I knew, intuitively, that the verticality of poetry--as opposed to the arc of fiction--required a certain amount of clarity (even as it moved through disorienting terrain). Largely, I am writing poems which, only *after* the fact, are in anyway linked, in my mind. I think this is a product of not wanting to become too "knowing" about the poems (and thereby close myself off to possibilities for poems (or even lines) that present themselves). I have also experimented, over the last few years, with series of poems with an obvious "book-length" sensibility. Ultimately, I think it's important to disorient yourself, a bit, as an artist: to force yourself into uncomfortable terrain: to tilt at your own sense of yourself as artist. I've found new ranges, poetically, in forcing myself to move back and forth between "writing a book" and "writing poems." I enjoy doing public readings, though I think of them as something that happens "after the fact." I am thankful that people will leave their homes and trek somewhere to listen to poems (mine or anyone's), but I think of it as wholly separate from the act of writing. In fact, I think being too aware of an(y) audience wouldn't allow me to fully encounter the poem as it presents itself to the imagination. But, yes, as an outgrowth of an incredibly solitary process, I quite enjoy giving readings: seeing the briefest looks of recognition, on the faces in the audience, is the closest any writer gets to evidence that the poems truly exist beyond himself. I don't have any theoretical concerns, per se, but I am often engaged with a quickly disappearing natural world and, more recently, with a world wholly mediated (increasingly, inevitably, and somewhat alarmingly) through technology. I am taken with the idea of writer as "witness," just as I am quite sure that, that is too heavy of a mantle to wear while writing, for many of us. I am quite engaged in my community, and I find it important, not so much for my writing, but for acknowledging the privileges of having been given loving parents, having attended good schools, having been lucky enough to have been born with a strong internal locus for motivation, and having had caring people intervene when I was coming untracked. And so, I have created creative-writing programs for at-risk youth (with the help of some of my most intelligent and dedicated university students). In the end, though, I think poets are doing vital work, for the larger culture, by creating poems that allows readers to traverse crises and to emerge (a bit more) re-sensitized to the world around them. It is (perhaps increasingly?) difficult work to feel and to think *beyond* ourselves, but there is no other way out of the cycle of war and environmental degradation and political repression...and poetry is a vehicle for "experiencing" that which is beyond ourselves. The editor for my book, Ascension Theory, was Mark Levine. Mark is, easily, the most intelligent and generous reader of poems I've ever encountered. I had a number of years to refine the manuscript before it was accepted for publication, so there were not as many edits as one might expect. That said, every edit that Mark offered was pitch-perfect and vital. Per my dealings with Mark, I would say that an editor who cares more about "poetry" than protecting any (aesthetic, political, editorial) agenda makes the editorial process a *learning* process--revealing things to the poet that had hidden in plain-sight. Robert Hass once told me to, "beware your social self." I was a graduate student and trying to navigate being "in the world" (socially, politically, etc.) and a growing sense of myself as an artist. Bob saw some tendencies to speak short-handedly (or humorously) about things for which I obviously cared very deeply. Luckily, he pointed this out and, in doing so, made clear (in an instant) how easily the creative process can become corrupted by speaking/living short-handedly. In other words, I think there was little hope that I would have become a poet--that I would have pursued poems with as much rigor as necessary--if I would have remained that "social self": the one who used short-handed language and humor as defense mechanisms against caring for the world. I have written some essays on the intersection of medicine and metaphor, and some short-fiction. I find that jumping genres reveals quite a lot about poetry (insofar as it reveals lists of "pertinent exclusions"--things that poetry does not afford, as readily). I also find moving between genres particularly helpful to my teaching of poetry and fiction and essay-writing, in that my students (even if they don't know it) often want the clearest boundaries drawn between genres, and while I cannot provide these clear lines (believing that they fall away, frequently) I can allay their anxieties about existing "between" genres. 11 - What kind of writing routine do you tend to keep, or do you even have one? How does a typical day (for you) begins? I prefer to work in the morning. I prefer to have a cup of tea and a heater blowing on my feet (I work in my basement). I am usually brought to the page by an image. I work for a few hours and then I read, or pick up my son from school, or go biking. Over the years, I've been asked by students many times about writing routines, and I've come to the conclusion that you must do *anything* that gets you to the computer and keeps you there (and does not, itself, create a distraction) and that you must be willing to let the routine evolve over time. I turn to other poets--historically, to Stevens and Niedecker and Ammons and Oppen and many others. I turn to visual artists and to films. 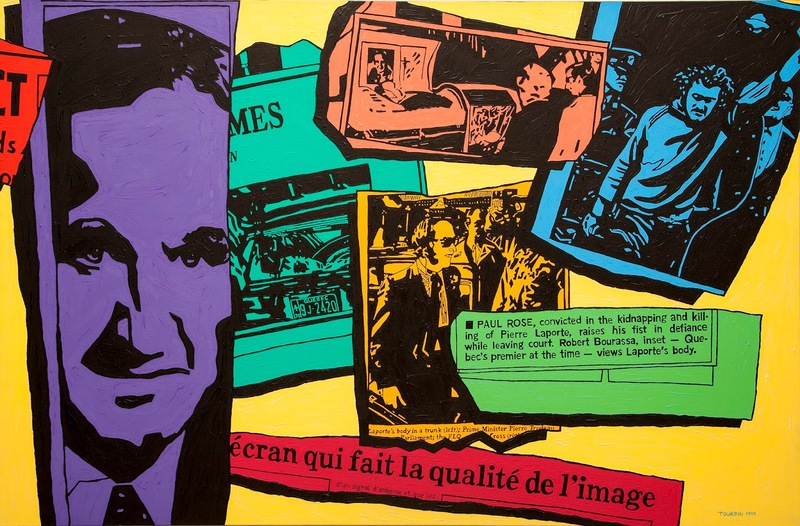 I find encountering visual art can be as important as encountering an important book. When we lived in Brooklyn, I went to the Brooklyn Museum almost weekly, and to MOMA and the Met, frequently, and wandering those corridors felt very much akin to engaging poems--and to adding to the imaginative "stores." There are paintings whose materiality and (almost pure) expressiveness and engagement with the world speak directly to what I hope to accomplish in a poem. I love teaching creative writing and I enjoy re-imagining / re-engaging creative-writing pedagogy. I often find myself rereading essays by Richard Hugo or Phil Levine or Donald Justice (or any number of other writer/teachers) in an effort to push my teaching--and to see how my understanding of their ideas has shifted with experience. Poetically? I couldn't say, except to say: nearly everything. Life-wise? I would paddle a canoe to the Hudson Bay. I would have continued working with young people in the wilderness. I needed to write poems. I would have felt, had I pursued another occupation, that I wasn't living the life I needed to live. There are many times another occupation would have been easier, but never "right." I'm working on a second manuscript of poems (titled "Human Headed") that includes a long(ish) series of poems from a particular speaker, and sections of poems that deal with changing/disappearing landscapes (and the people caught in these disappearances). Monday, 3 February, 5:00 – 7:30 p.m.
Monday, 3 March, 7:00 p.m.
Monday, 10 March, 7:00 p.m.
© The Estate of Dennis Tourbin, CARCC, 2013. CUAG is located at the north end of the Carleton campus, in the St. Patrick’s building. Parking passes ($4.00 flat rate) will be sold by CUAG staff just prior to the events. Details of this are listed just below the map on CUAG’s website (see link provided above). 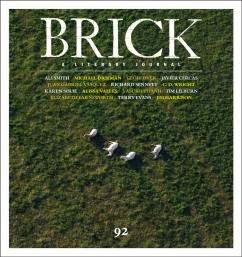 Brick: A Literary Journal has long been one of my favourite Canadian literary journals, providing insight into the familiar and the unfamiliar, usually showcasing international writers and works I hadn’t previously had any awareness of, and this issue features an interview by Brick regular Eleanor Wachtel with writer Richard Sennett, an interview by Forrest Gander with Eikoh Hosoe, and essays by Donald Richie, Simon Loftus, Tim Lilburn and Baziju (the collaborative author made up of poets Kim Maltman and Roo Borson). Ottawa writer and translator Mark Fried includes an essay on Severo Sarduy, to accompany a short story by the same writer, translated by Fried. So many of the pieces collected in each issue, whether non-fiction, interviews, fiction, photography, correspondence and even the occasional poem, are wrapped around ideas of small, detailed moments, memory and deep attention. We need to pay attention. I came across an artist on YouTube, Michael David, who’d built a greenhouse out of glass daguerreotypes because the story, mythologized in a few seconds in a documentary film on the Civil War, haunted him so. Linda Bierds wrote a series of poems about glass-plate greenhouses for her book The Profile Makers. Collage artist Michael Oatman recreated the structure with a group of architectural students. Ideas make me think of seed pods. They way they burst and scatter and float and settle and sit and warm to the dirt. Take root, grow too stubborn to pull out. In fact, the story isn’t true. The Library of Congress can account for the majority of the glass plates in the Civil War Collection—even broken plates are painstakingly collected, each sliver in its own pocket. No collection is missing enough plates to have built a field of greenhouses. But as with most legends, the message about transience is true. It’s what I think about when I think of photographs. We don’t want to be betrayed by time. We want our memories to stick around. 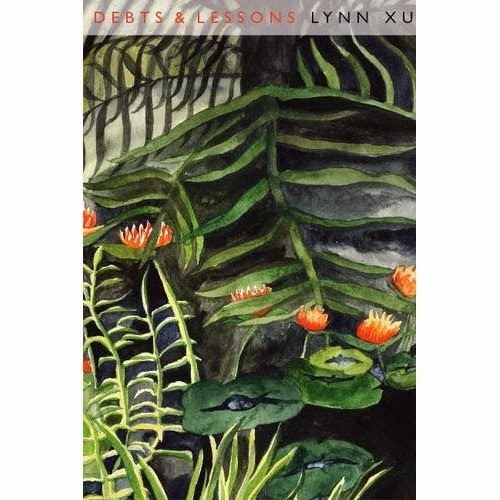 My review of Lynn Xu's Debts & Lessons (Omnidawn, 2013) is now online at Galatea Resurrects. 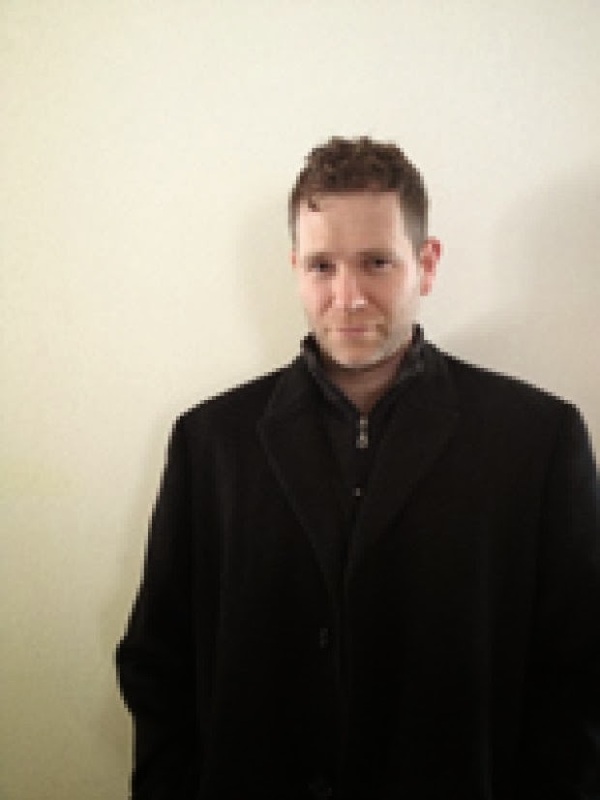 Brian Mihok's work has appeared or is forthcoming in Everyday Genius, Vol. 1 Brooklyn, Hobart, American Short Fiction online and elsewhere. His novel The Quantum Manual of Style was released by Aqueous Books in 2013. He is associate editor for sunnyoutside press and editor of matchbook, a literary journal of indeterminate prose. He also makes videos you can find at brianmihok.com. My first book, The Quantum Manual of Style, was just released this year. As far as comparing it to my other work, it's pretty different. I've never quite written a story or book with this much artifice before. I don't know if it's really changed my life, but it's fun to have a book that people can buy and read. It plucks a different chord for my writing life having a book out. I mostly write because I enjoy it, but it's fun to get published and when you have a book come out it feels like a big accomplishment. Most of my other fiction is more story-looking. This book is broken into rules and terms and a story gets woven throughout that form so at first glance it doesn't look like fiction at all. The first thing I remember writing were stories staring Warner Bros. characters, like Wile E. Coyote and Bugs Bunny. So I guess that was fiction. albeit fan fiction, but I was seven so, you know. I did write fiction and poetry as a teenager. I'm not entirely sure why I focused more on fiction as I got older. Probably just because I didn't know enough poetry. At this point I've written and published both fiction and poems, though mostly fiction. I love poetry now that I have read a bunch. I know the difference between the two when I see it mostly, but I don't necessarily go around thinking I AM FICTION, I AM NOT POETRY. I have been writing some creative non-fiction recently, though. That's been pretty fun. I had a piece about Buffalo, NY on American Short Fiction's site not long ago. I'm having another piece that's kind of like a weird personal essay come out in a magazine here called Block Club. That should be out in January. Depends on the project. Since moving from Western Massachusetts to Buffalo I have written a lot, which was mostly due to the fact that I didn't know many people in Buffalo. It allotted me time. I've written drafts of three books in the past four years. Before moving to Buffalo I would have said my writing was a bit slow, but now I think it's kind of fast. I tend to write a draft of a story in just a few days. Then it can take anywhere from a week to years to finish it. I have written stories that really just needed a once or twice over and they were good to go. Others have taken what feels like forever. One story I just finished and will be coming out in Everyday Genius sometime soon, I wrote a couple years ago, but the ending was never right. After rewriting the ending about 30 times I finally found it. I had to put the story down for a bit and then one day randomly opened it up and wrote the right ending. Go figure. So I'd say the final drafts don't really look the same as the roughs, but very very very occasionally I get lucky and put something down that just clicks. Most of the time I think I just write short stories. I don't intend them to get connected and when I have tried to do that it comes out poorly. I wind up sticking so closely to the connections, in order to preserve them, I forget to make the stories good on their own. Making books is hard and confusing and at some point I'm working on something and say, okay this is maybe a book. I like going to readings and doing readings mostly because of the people I get to meet and see. I'd like to evolve my reading performances to be something better than they are. They aren't really a part of my creative process, but they aren't counter to it either. Mostly I view readings as part of the deal of being a writer because, well, it is. I don't try to be too theoretical in my stories, and if I do I go over the top like with The Quantum Manual of Style. I don't have that much fun reading theory. Sometimes it's fun but a lot of times it isn't so I don't really want to write stories like that. I definitely am not trying to answer any questions with my work. I'd rather further the question(s) than attempt any answers because what possible answers could I come up with? I don't think art is there for answers. The only answer art has ever given me is to the question of "What do I care most about besides other people?" The writer should be an observer and a creative recorder and a connector. When I read great writing I feel together with humanity. I feel a part of something that matters. There have only been a handful of things that humans have consistently done for thousands of years and literature is one of them. That means literature is doing something that matters to us fundamentally, even when we can't name that thing. An outside editor can be either. It depends on the working relationship, but to answer what I think is the intention of the question, I don't necessarily have any problems with working with an outside editor. I just try to choose them wisely. Something specific: write dialog like it is a tennis match between the speakers. What makes tennis fun to witness is the action between the players, the spin on the ball so that each player doesn't know where the ball is going. It's surprising, unexpected. Anything that isn't a part of the match, cut. Fiction is not film. You don't need to read someone say hello when they pick up the phone. 10 - How easy has it been for you to move between genres (fiction to filmmaking)? What do you see as the appeal? It hasn't been difficult to move between them because to me they are very different things. I don't confuse them, I mean. Fiction can do things film can't and vice versa. I love film. It's as exciting as literature to me. The exciting thing about film is that while literature has been around for a couple thousand years, film has only been around for 100 years. Think of all the innovation in thousands of years of literature. That is what film is just waiting around for. Isn't that exciting? This year has been frustratingly busy so my writing routine went out the window, but typically I like to write everyday. The time of day doesn't matter much, but I like to write a page. I feel like if I can sit down and write a page almost everyday I could theoretically write 300+ pages a year. That's good. As far as the day beginning, I'm not good at writing first thing in the morning. My brain doesn't fire on all cylinders early. I wish it did. I wish I could get up at 6am and just get it in and then have the day filled with all the things it gets filled with. Usually I'll be in a reading mode or a writing mode, but not both. I don't necessarily do a lot of reading while I'm in the writing mode. So if I find that writing is slowing down, it may mean I just need to read some books. Refills the tank. The smell of dirt. When I was in middle school my family moved from New Jersey to Florida. One of the biggest differences was the dirt in Florida, or lack of it. Florida is all sand and limestone. When I smell dirt, I think of that time long ago when I longed for the ground beneath my feet to be real dirt and not shifting sand. Absolutely. Part of the premise for The Quantum Manual of Style came about as the result of my interest in pop science. I love reading about the recent discoveries and edges of knowledge. When those boundaries get shifted. I also play music. I like lots of different kinds of art and it all swirls in my head, interconnected. I get influenced by everything. Tons: Gabe Durham, Jeannie Hoag, Seth Landman, Heather Christle, Boomer Pinches, Rachel B. Glaser, Melville, Hawthorne, Lydia Davis, Mary Gaitskill, Borges, Lisa Jarnot, Chris Bachelder, Noy Holland, Sabina Murray, James Tate, on and on. I have yet to go on an extended book tour. That'd be fun. Awfully tough. I am trying to think back to a point when I would have chosen something else. Can't think of it. If not writing it would have just been some other art. It was one of the earliest tools to make art in a way that was fun and exciting. Also I think it's just the art that I am best at. I just read Tomaz Salamun's book of poems called A Ballad for Metka Krasovec and enjoyed it a ton. Best film in a while was The Apostle, written, directed, and starred in by Robert Duvall. I liked Robert Duvall before but now I love him. Just finishing up a short collection of stories called Country of Warehouses. I hope to start a novel soon. swum with the sea cow. troubles of the old, black cat. toward the abyss and draw back. looking for the center of the earth. There is such a sadness resting behind so many of these poems, coupled with a particular kind of fantastic observation that couldn’t be achieved any other way, akin to light shining through a deep dark. Hers are long passages that accumulate strikes and quirky lines and the collision of emotional highs and lows. There is a distinctive and oddball charm to these poems, whether the poem “Because You Love You Come Apart,” that opens with “Your hair is wonderful today. / This is a microscopic caress at a party.” or the poem “Elegy,” subtitled “with Judy Garland & refrigerator,” with lines some of which strike as hard and deep as a punch: “I take out my collection / of tissue and listen to Judy Garland / sing Have Yourself A Merry Little Christmas, / her voice like some wildflower / absorbing into the crimped human mind / an infinite medium of grief— / this human brain that cannot assume / the trust position.” How does anyone manage such forceful writing from a first trade collection? Perhaps as the daughter of poet Abigail Stone and granddaughter of poet Ruth Stone, she had the advantage of a particular kind of education, or perhaps her innate attention to detail and the line was all she required. And there is a deep attention here, to a life as it is lived, and to the quirky thoughts that so often quickly pass, and those dark places we aren’t meant to visit, let alone attempt to understand. of anything except the moon anymore? You might have noticed by now: I have very few non-baby photos these days. Here is another. consternation and confusion. little or no time, persons or property. the people striving. get on the ground sooner. the fire should reach them. next, struggling to save the most valuable. the cries the roaring hunted at the same time by the yelling dogs. the lack of capacity. it baffles description. a dense cloud of smoke. the whole country day by day. far out to sea. awfully grand but also terrific. all the houses. an extensive district. flames at once. a height of eleven o’clock. two hundred and fifty blazing houses. many of the owners. in or out of the flames. I could not tell. the conflagration lasted. the whole of the dwellings. during one of these days. a boat was lost. Philadelphia PA: Anyone who follows these posts knows that I’ve long been a fan of Philadelphia poet Pattie McCarthy, so couldn’t help but get excited to hear about the publication of the chapbook scenes from the lives of my parents (New Jersey: Bloof Books, 2014). The poems in this small collection each begin with a small asterisk and opening line, as though the entire work a sequence of footnotes, broadening the scope of information presented within an unseen source. Perhaps the footnotes exist as the real story, the important moments, between the mundane pieces of living. Perhaps it doesn’t matter. Many of McCarthy’s poems over the years have been composed in part from her apparent love of research into medieval subjects, topics and sources, blended with contemporary, personal and familial references, including her children, all of which come through with an incredible, staccato ease. Her poems bounce and leap and have such a wonderful sense of sound and play that I don’t see in that many other writers (Sylvia Legris, perhaps, or Emily Carr, among others). Apparently another chapbook, Nulls, is forthcoming this year from Horse Less Press, as is fifteen genre scenes from the newly-established eth press. I look forward to all. her birth pangs (perhaps an alteration of prong). burned alive. the midwife was also executed.